Description: Sexes similar. 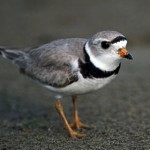 Two complete black breast bands are distinctive. Grayish-brown above, and white below. Reddish-orange rump is visible in flight. Habitat: Highly adaptable. 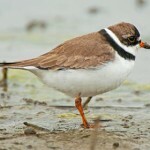 Found in open fields during migration and usually breeds near wetlands with exposed ground. 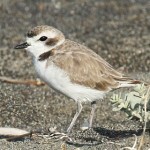 Prefers to nest in stony or sandy areas, but will nest in a variety of locations. 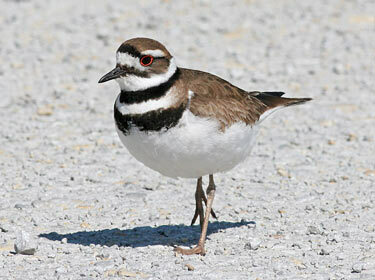 Where in Nebraska: Common to abundant spring and fall migrant and summer resident across the state. Occasionally overwinters. Regular breeder. Fun Facts: Known for its distraction display of faking a broken wing. Often found along roadsides. A very hardy and vociferous species.